Featured on Spirited Woman Top 12 Valentine’s Day Pick List! 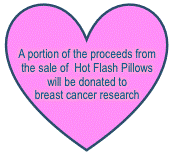 Hot Flash Pillow is delighted to be featured on the Spirited Woman’s Top 12 Valentine’s Day Pick List! You can check out the Spirited Woman website for other interesting resources.